An Abandoned Hotel, a town that resembles Workington, but with great beaches and the Beach of the Dead. First effort of 2018 for me and it will be brief. Probably should have said ‘pathetically brief,’ not just ‘brief,’ but anyway… life’s too short to type as Shakespeare once said. Well, he may have done. 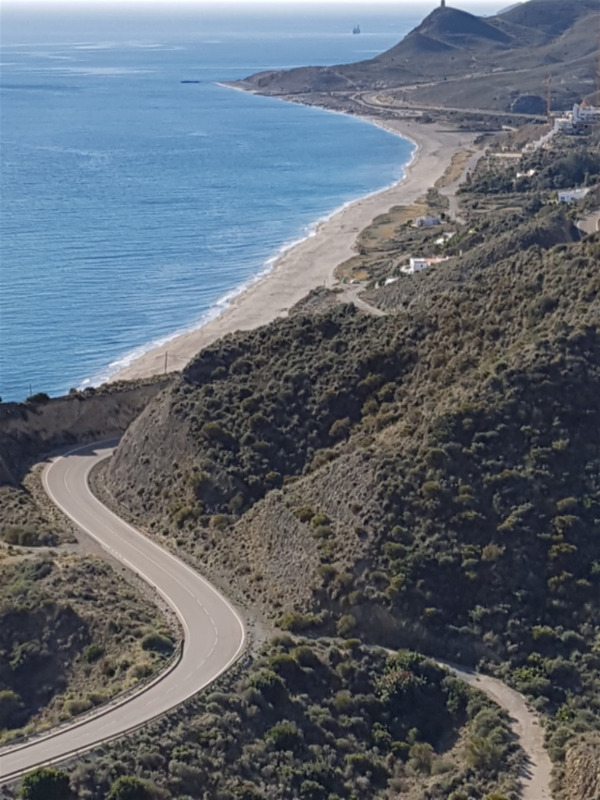 We’re back in Mojacar the Beautiful after some pretty exhausting New Year celebrations and very happy to be here in one of our favourite places in Spain. It hardly ever rains here, the sun shines almost every day, even in winter, there’s lots to do and the people here are nice too. I said to G the other day, ‘let’s go off for the day, but not too far.’ We ended up driving no more than about ten miles and had a brilliant day. 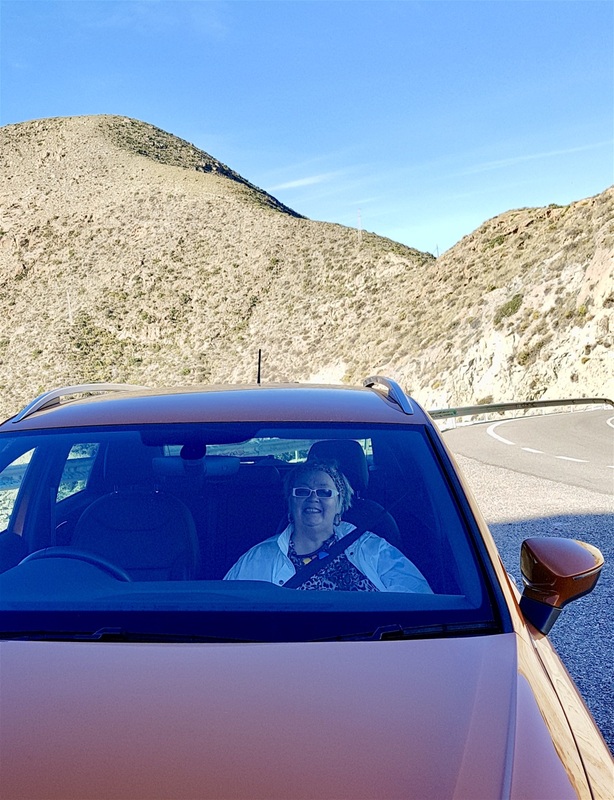 We drove out of Mojacar up the hill leading to Carboneras. Every time we pass this way we look at the Macenas golf course and think what a shame it is as everything is brown, hardly a blade of grass anywhere. We played golf here a few years ago when it was still ‘green.’ More accurately, G played golf and I drove the electric buggy, very fast and G said very dangerously at times. Well, how was I to know there was a steep hill just round the corner? We flew down it at what seemed like 100 mph, but probably wasn’t. I remember I had a sore throat from screeching and G said he wouldn’t have been so worried if I hadn’t closed my eyes and taken both hands of the wheel. I’m a very good golf caddy. I don’t actually carry any clubs or know anything about golf, but I do clap wildly at good shots and pretend not to notice the bad ones. Sometimes we have a putting competition on the practise greens and the rule is that I can have another go if I do a bad putt and we only stop playing when I win three holes. Or when it starts to get dark! We drove past the tapas bar at the top of the first hill as it was full of cyclists and there were no free seats. 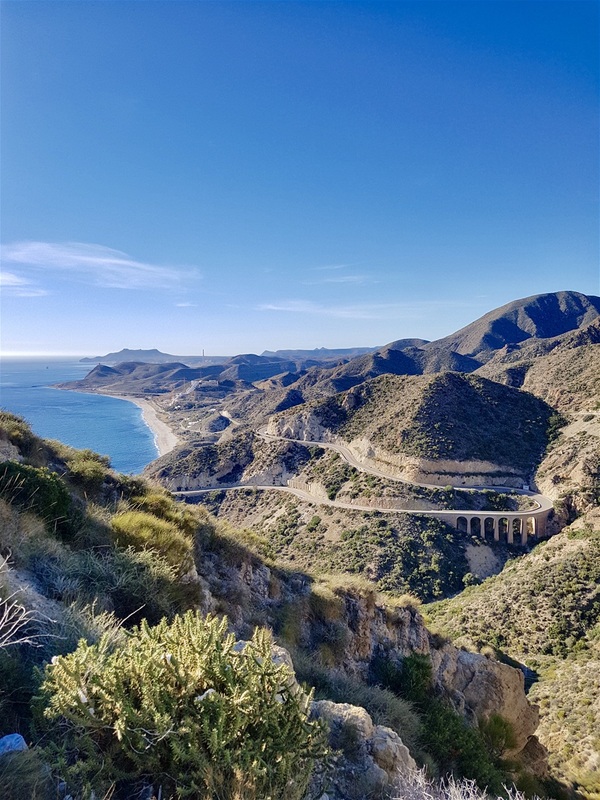 Cyclists love going up the hill from Mojacar, over the top and down to Carboneras and then go straight back again. Very exhausting and very sweaty, especially when wearing Lycra. The cyclists today were quite fat, especially for Lycra shorts and tops, and very sweaty so we carried on going. G stopped at the top to take some photos of the winding road going down the hill and the sea looked fantastic, very blue and no waves at all. There were two people on motorbikes in the lay-by, looked like a boy and a girl, snogging. Not easy when leaning over, sitting on their bikes and wearing crash helmets, but it didn’t seem to bother them. The ‘girl’ took her helmet off and she was about 60 with a huge nose. I was quite glad the ‘boy’ kept his helmet on. Two cyclists puffed past us, looking very red and very hot. One of them had a woolly Santa hat on his head which he took off as he passed me and bowed which made us laugh. I also waved to a man driving a camper van going the other way, just because I liked the camper. 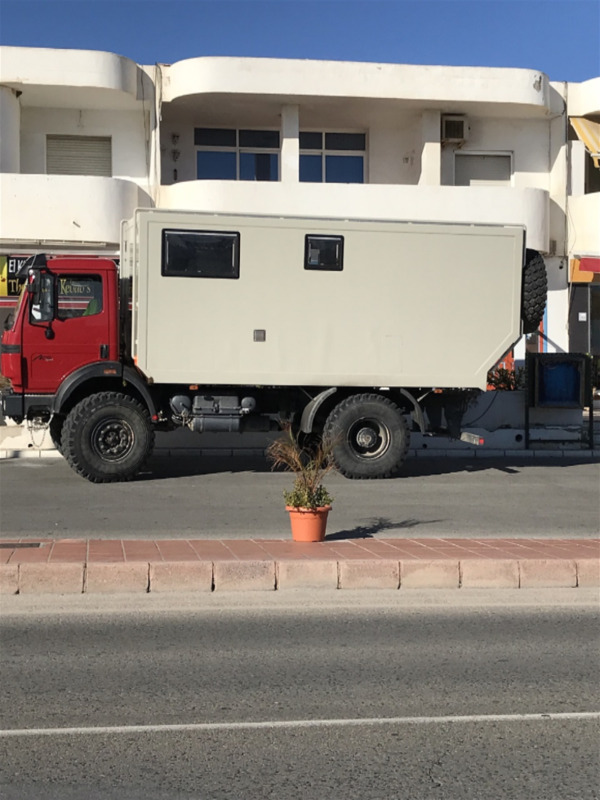 We saw it parked up the next day, but it was empty. Perhaps he was in hiding from mad English women who wave madly at him as he’s trying to go round a very sharp bend at the top of a mountain. At the bottom of the hill is a big hotel complex which was never finished. I could tell you all about it, but would have to look up stuff so have told G to do it instead. I meant ‘asked,’ not ‘told’ in case you think I’m a bossy woman. We went through Carboneras which is an odd place. It has lovely beaches, a good promenade and the sea is very clear, but there’s lots of industrial buildings here as well. We went to one of the best beaches in Spain, which took a bit of getting to but was worth it. Nobody else was there even though it was a gorgeous day. January, in Spain, is one of our favourite months. 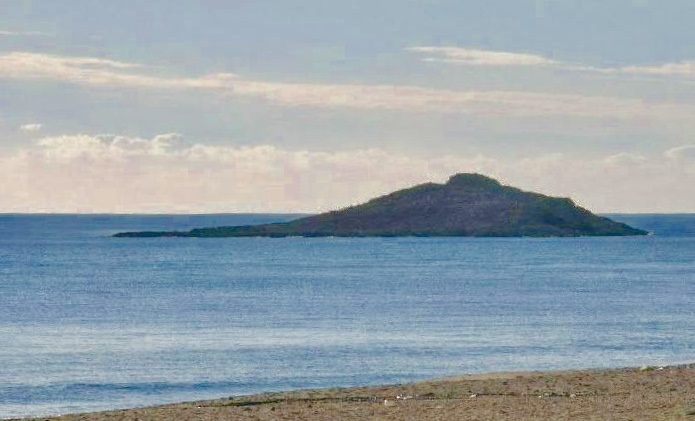 There are no crowds, you can park the car anywhere, the beaches are empty, the sun usually shines all day and we can walk along a sea shore gazing at a cerulean sea and golden sands under a bright blue cloudless sky. Perfection! 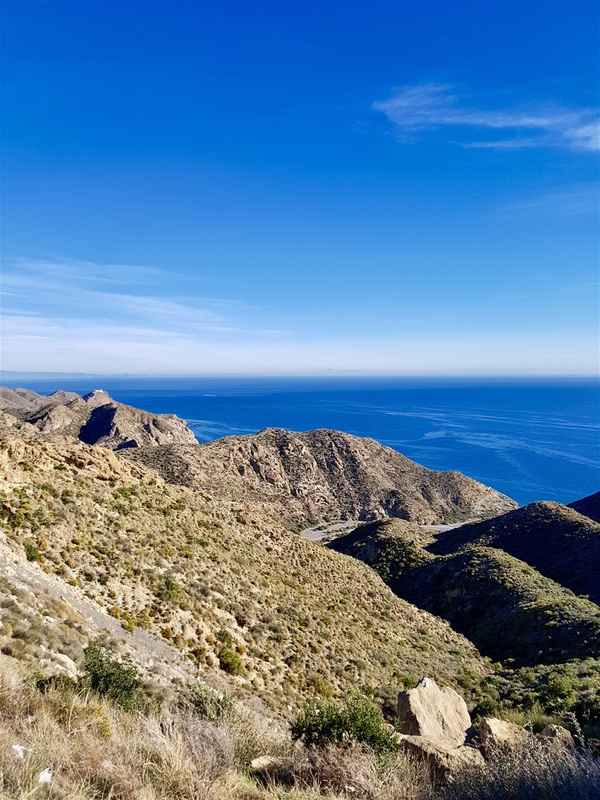 On a day just like this, we set off over the mountain top towards Carboneras, the starting point for the Cabo de Gata National Park. 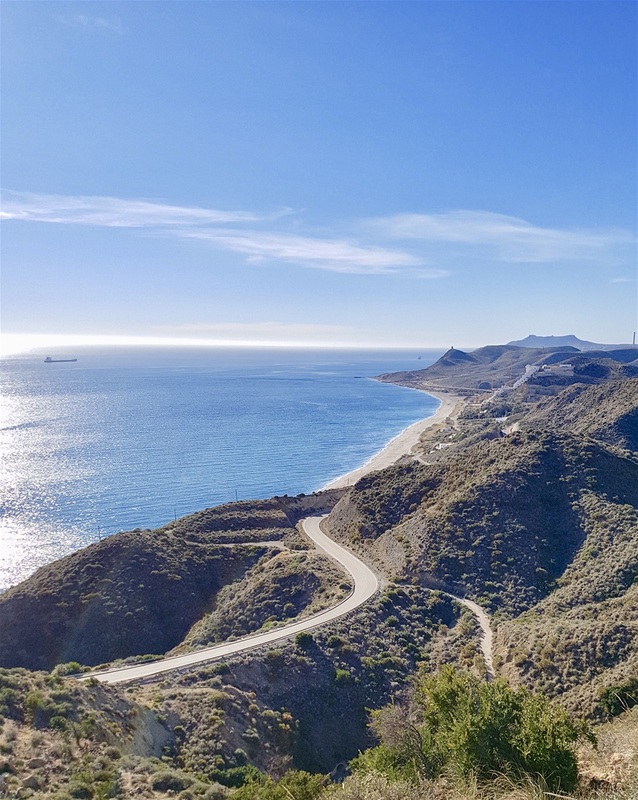 Carboneras translates as ‘coal bunkers’ in English, coal mining and charcoal burning are no longer the main industries, but even so, with a name like that, expectations for a visitor are never going to be sky high. Even so, we’re here and determined to find something of interest. Even before we reach Carboneras, there’s one of the saddest sights, or sites, in Spain: the abandoned hotel complex perched right above the beach, known as El Algarrobico. Twenty years or so ago, a developer, Azata del Sol, submitted plans for a 21 storey, 411 roomed four-star hotel, to be followed by an 18-hole golf course and 1,500 houses/apartments. 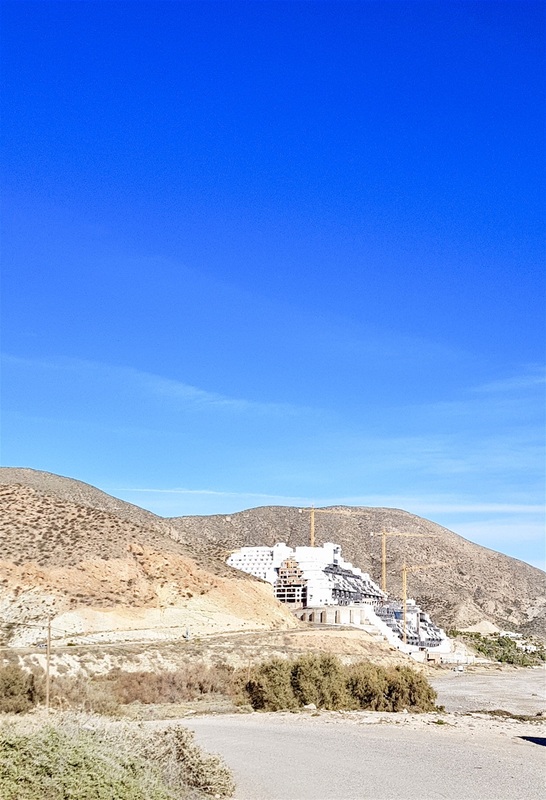 The Carboneras council and residents would benefit greatly from the development, jobs were on the way and adding value to the Town Hall coffers was eagerly anticipated. In 2003, the local Junta granted a licence to start building work. Problems soon arose. 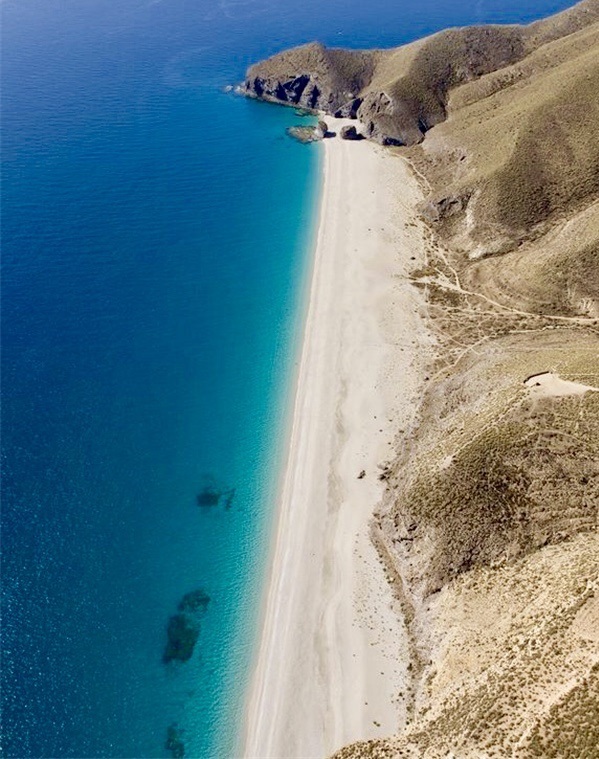 Environmental activists argued that the site was (just about) within the Cabo de Gata Natural Park, one of Europe’s largest marine and territory nature reserves, and within two years the Spanish government overruled the local council, claiming the hotel development had broken Coastal Law, which forbids building within 330 feet of the sea and ordered its immediate demolition. The hotel construction was almost complete by now, but a judge cancelled the building licence amidst numerous claims of bribery, corruption and falsification of planning permission documents. Very Spanish, this great divide between the Government in Madrid and the local council, and the row rumbled on through the courts with no sign of resolution, but the real drama was yet to come. In 2007, Greenpeace activists took direct action, scaling the building and daubing the slogan, ‘Illegal Hotel’ in huge letters across the freshly painted façade. The Greenpeace activists kept the pressure on, occupying part of the empty hotel until a fresh court judgement ruled the project legal and that work should continue. ‘This monstrosity is the symbol of the destruction of our coasts,’ a Greenpeace spokesman said, but locally, everyone on the local council was happy. ‘The council continues to believe that the best option for this hotel after such a huge investment is that it is completed and opened to provide wealth and jobs for the town,’ Salvador Hernandez, the mayor of Carbonera said. The hotel remains empty, a daubed slogan on the side now reads, ‘Hotel, Si’ and the legal wrangles veer between allowing the project to be completed or be demolished. I was talking to a couple of locals in a bar recently. One said the hotel being demolished would deprive the town of hundreds of potential jobs. The other suggested the jobless of Carboneras could always apply for work at the demolition firm. I suspect the hotel, which is a bit of an eyesore in its present condition, will still be here in another ten years. We parked up in the town and made our way to a café on the almost deserted promenade. The sea was gleaming and even the Island of San Andres looked attractive. It’s no idyllic desert island, just a small lump of volcanic rock just offshore. Even so, it’s a bit special, this barren, uninhabited hump in the water as it supports any amount of fish, crabs and seabirds. The fish feed on the lush and splendidly named Poseidonia Oceanica, (also referenced by the rather more prosaic name of Neptune Grass,) which is a type of lush weed only found in certain areas of the Mediterranean and it is the presence of this weed that helps keep the water so crystal clear. We snorkel dived here a few years back, and we’re the only people on the beach today, but weren’t tempted to go skinny dipping in January no matter how pleasant the sunshine. As we drive on along the road bordering the sea, it gets more ‘industrial.’ Not exactly a backdrop to the the set of Peaky Blinders, but even so the port area stands out starkly from the strictly conserved (random hotel developments notwithstanding,) and seemingly untouched inland nature reserve of the Cabo de Gato. The background to the port is tall chimney stacks, a relentless procession of lorries going to and from the harbour, a particularly unattractive (coal burning) power station with its accompanying noxious eructations and the scarred remnants of what were once dense forests and coal deposits on the surrounding hills. There’s an impressive desalination plant here as well, one of the largest in the world and any method of obtaining water in such an arid region is welcome. 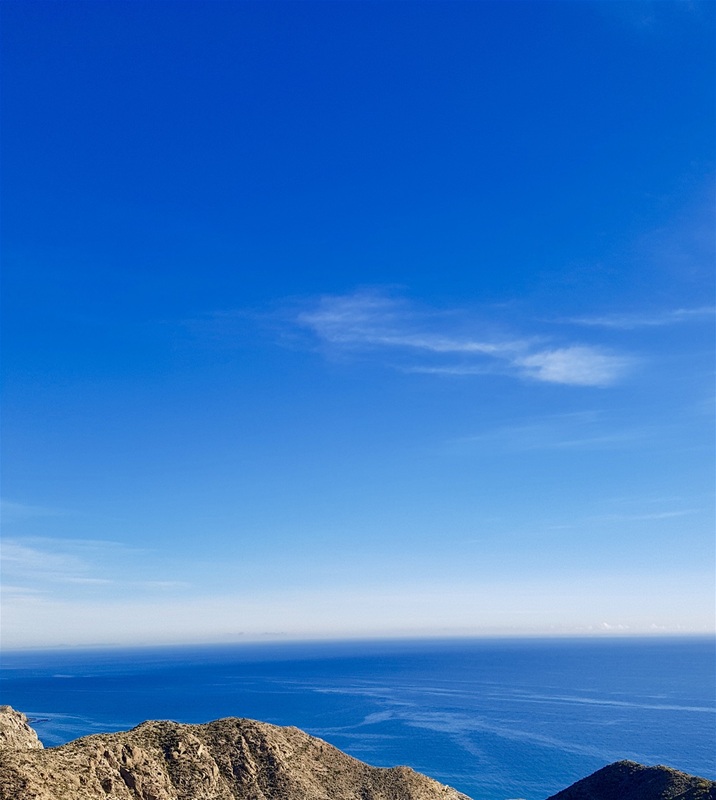 Producing fresh water from seawater will have great benefits. 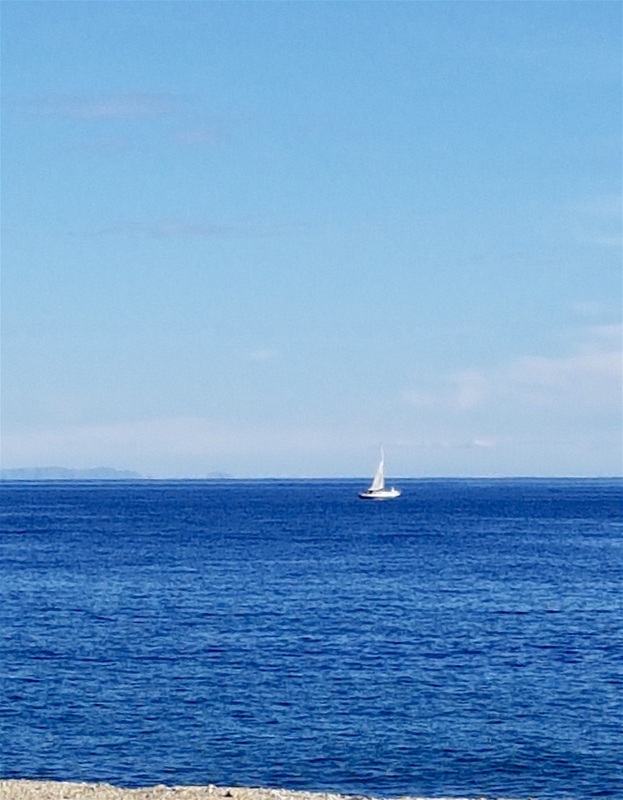 I just about understand the basic theory – stripping out the salt content of sea water by means of reverse osmosis – but anyone seeking any more detail is reading the wrong blog! I read a leaflet about the plant where it says output is 120,000 cubic metres of fresh water every day. That’s impressive. Much will be of lower quality and intended for irrigation, but thousands of litres of fresh drinking water, recovered directly from the sea, is being sent all around this parched region every day. Water is a precious commodity in this area, but even so there are limits on what agriculture will pay for it so the plant is currently operating welll below its capacity as the farmers consider the costs are too high. 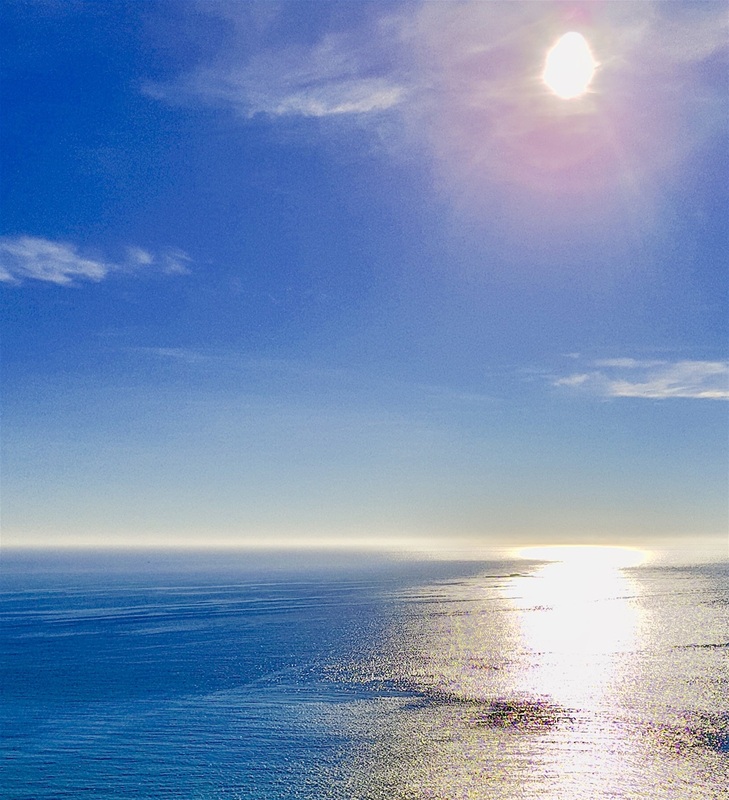 I read recently that water will become as vital in this century as oil was to the last, but supply and demand, as ever, sets prices and desalination remains an expensive option, for now. Beach of the Dead? Pretty grim name, but when we eventually find our way to the viewpoint overlooking the beach it’s a real treat. The French word trouvaille sums it up best. An unexpected and almost overwhelming delight, like one of those Caribbean beaches the holiday industry use to persuade their stressed out potential customers of their pressing need to seek out a little piece of paradise. It’s been voted ‘best beach in Spain’ for three consecutive years, a pretty impressive claim. It’s a beach, no facilities, no shade, nothing but sand and the clear water of a gently lapping sea. One way of ensuring a ‘perfect’ beach is to have its only viable access, unless you want to try the sea kayak method from Carboneras, be extremely difficult. The track is steep and rutted, certainly no place for flip-flops, and we’re wary of twisting an ankle, or worse, as we edge our way down. I’m wearing shorts and sandals today and reject Marigold’s suggestion of changing into the pair of shoes in the car boot. At one point, having helped Marigold across a particularly difficult section, I manage to stub the same big toe that had required the removal of an ingrown toe nail. It’s significantly more painful without a protective toenail, as I point out to Marigold who is remarkably unsympathetic with an unsaid ‘I told you to put shoes on’ expression in evidence? She even fails to comment on my remembering being told the medical term for a big toe is a hallux, even though I was given that information during the amputation procedure, a time not best suited to memory retention! Perhaps she’s doubting my claim of this being a ‘pretty easy track down to the beach.’ In fairness, it’s not easy at all. Once we arrived though, it’s worth every careful step. 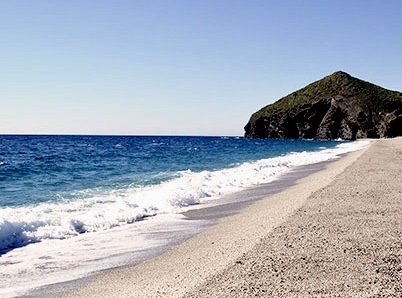 The name comes from the vast numbers of shipwrecked pirates who supposedly washed up here, but we’re relieved to find a deserted stretch of sand and dramatic pyroclastic rock formations without a drowned pirate to be seen. It’s a nudist beach too, but we aren’t tempted to remove our liberty bodices. What’s the point if there’s nobody else here to marvel at our magnificent bodies? We walk along the beach, clamber over rocks, paddle in the clear water, admire the graceful progress of a brightly speckled fish and, as we finally prepare to clamber back up the track to where our car is baking in the sun, we see a pair of dolphins swooping and gambolling their way along the coast. The perfect end to any day. Of course, we still have to climb up this goat track to the top of a mountain.